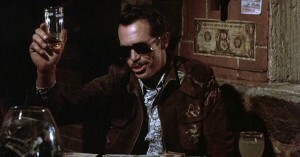 Warren Oates goes for broke in Bring Me the Head of Alfredo Garcia. Reviled on its release in 1974, Sam Peckinpah’s (The Wild Bunch) nihilistic yet poetic action-accented crime drama Bring Me the Head of Alfredo Garcia is today considered to be a masterwork of the filmmaker and leading man Warren Oates (Badlands). Special features on the Blu-ray release of this cult favorite include an isolated soundtrack (Jerry Fielding composed the poignant score), an audio commentary with writer/producer Gordon Dawson and film historian Nick Redman, another commentary with film historians Paul Seydor, Garner Simmons, David Weddle, and Nick Redman, Passion & Poetry: Sam’s Favorite Film, A Writer’s Journey: Garner Simmons with Sam Peckinpah in Mexico, Promoting Alfredo Garcia, 6 TV spots, the original theatrical trailer, liner notes by Julie Kirgo. Supplier Twilight Time has announced that though the transfer is detailed, colorful, and sharp, there are recurring incidences of white speckling, also known as “minus density. ” TT reminds us that Alfredo Garcia was a low-budget, indie road movie, shot entirely on location in Mexico and that this transfer is the same as the one used in foreign territory high-definition releases. As Twilight Time prints up only 3,000 copies of each title, the time to pre-order your Blu-ray discs directly from distributor Screen Archives NOW!